Encaustic cement tiles get their name from the term "encaustic" which is a old world technique for metal enameling. Because of similarities in their manufacture, cement tiles adopted the same name. 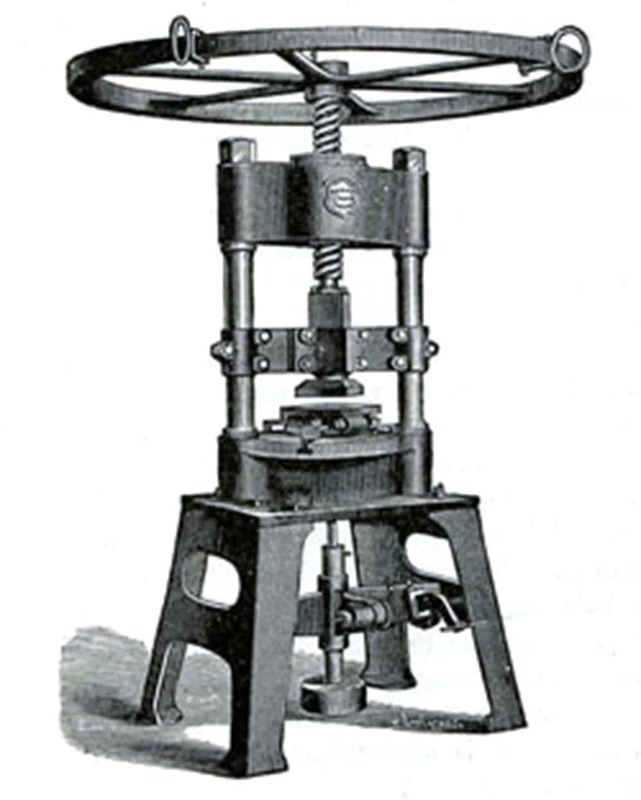 The French and Catalans were the first to use the technique in the 1850’s both in France and in Barcelona. Complex patterns used in the tiles are due to an interest in ancient cultures, most notably early Moorish art. As a result, the tiles spread throughout Europe as a high quality flooring material and then onto former European colonies in Latin America, North Africa, and Vietnam. 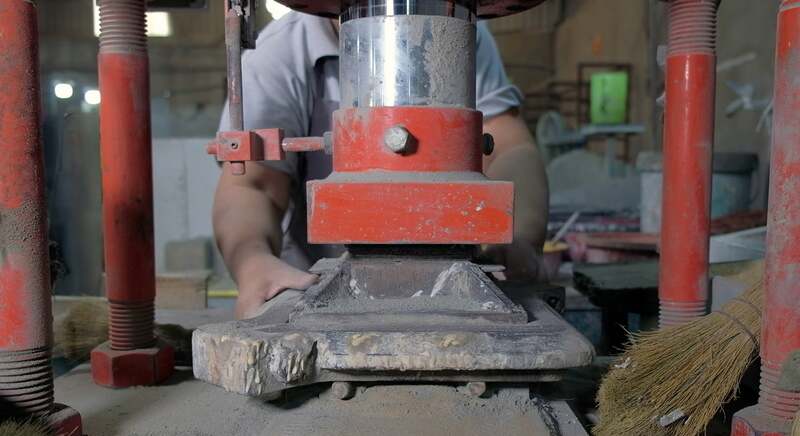 We make our modern cement tiles by hand, one at a time, using mineral pigments, cement, a mold, and a hydraulic press. Our cement tiles are unique and one of a kind, an as such, each tile will be subtly different from the next. A copper mold is used to make the individual patterns by applying separate pigments. 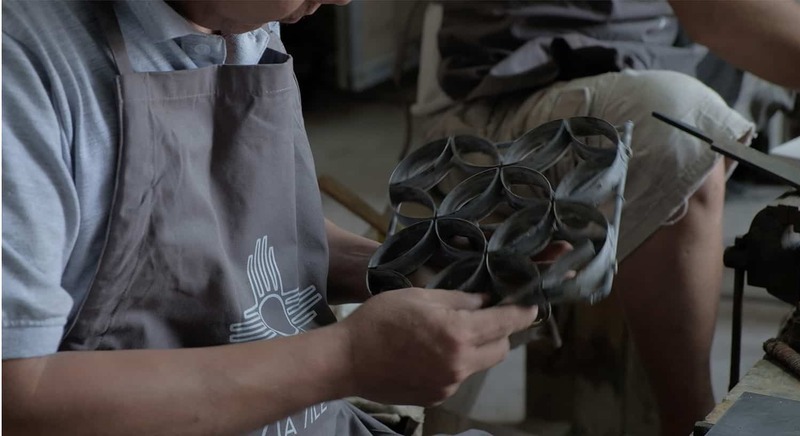 The process is incredibly delicate, requiring skilled artisans with years of experience. Find installation and maintenance resources on our website. Cement tiles are made by hand, one at a time, using mineral pigments, cement, a mold, and a hydraulic press. 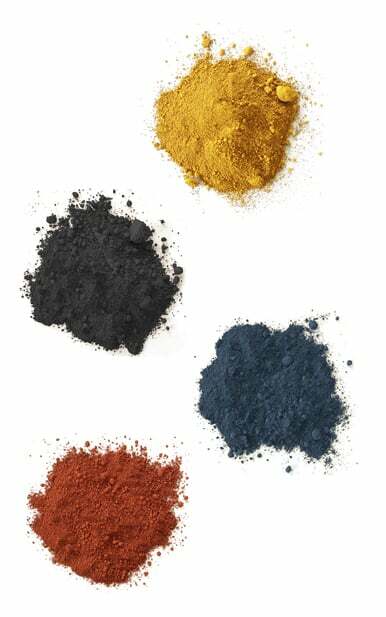 The pigment composition is a mixture of high quality white Portland cement, marble powder, fine sand, and natural mineral color pigments.The individual patterns are made by manually applying separate pigments, one by one, in a handmade copper mold. It is an incredibly delicate and skilled process that can only be performed by highly trained artisans. Cement tiles are not fired; there is no glaze layer on the surface of the tile. They derive their durability from the combination of finely dehydrated cement and a more coarse sand/cement layer. The pigment layer is hydraulically pressed into the surface and becomes a part of the tile. The tiles are then soaked in a water bath for 24 hours and then set to dry for another seven days. Proper installation and protection of cement tile is key. Please ensure that tile is laid by a licensed tile installer. Zia Tile is not responsible for any issues that arise due to improper installation or care. DO NOT LET THE BOXES GET WET! Moisture can seep into the tiles, which may result in staining or efflorescence in which a residual powdery limestone layer is deposited on the surface of the tile. We do not recommend installing our tiles outdoors in places that experience frost/freeze in winter. Care must also be taken in areas that may get wet as the surface may cause a slip hazard. Cement tiles are unable to withstand the weight of vehicles and therefore should never be used in driveways. Wall tiles can be affixed to plaster, drywall, cement block, and cement backer board. The installation surface should be flat and dry with any loose paint removed and cracked surfaces patched. New construction foundations should cure at least 30 days prior to installing any tile. Please inspect your order thoroughly as Zia Tile cannot be held responsible for tiles that have been installed. If the subfloor is even and in good condition, a high quality medium-bed thin set is sufficient to set the tiles. Please make sure the subfloor has completely cured to prevent efflorescence spots from depositing on the surface of the tiles as moisture evaporates through them. Evenly apply the thin set mixture to the subfloor using a trowel. Wet the back of each tile with a sponge before applying the adhesive to the back of each tile, making sure to apply the mixture in the same direction in order to prevent air pockets from forming. Using only the palm of your hand, press the tiles into place. Use of a rubber hammer or mallet will result in small cracks that will grow over time. Ensure the tiles are perfectly flat during installation as uneven tiles cannot be ground down. Immediately wipe off any residual thin set from the surface of the tiles. It can be incredibly difficult to remove without damaging the tiles if left too long. Use 1/16” tile spacers to separate the tiles. All saw cuts must be made with a water-cooled tile saw. After the tiles have been laid, allow the thin set at least 48 hours to cure before sealing and grouting. Cement Tiles must be sealed on-site. Use a pH neutral cleaner before sealing; products made to clean natural stone are usually suitable. We recommend using 511 Porous Plus Sealer from Miracle Sealants or other high performance cement tile sealers. After laying the tile and prior to grouting, apply sealer in thin layers until the tiles become saturated, wiping off any excess sealer before it dries. Thick or excessive application of sealant can dry unevenly, and result in an undesirable waxy film on the surface of the tiles. Allow sealer to cure, typically 1-2 days; always follow the sealant manufacturers application instructions. Using only standard, neutral colored un-sanded grout, fill in the gaps between the tiles with a rubber grout float. DO NOT grout the entire floor at once, as the tiles can stain and excess grout is extremely difficult to remove later. Instead, grout small areas and immediately wipe away the excess grout as you go. Dark grout can stain lighter colored tiles and should be avoided unless hand grouting or using a grout bag. Before resealing, allow the grout to cure, usually 48 hours. Clean the tiles with pH neutral detergent, removing any residual mortar or debris. Never leave spills, drips, footprints, or any other marks on the tiles prior to sealing. Completely clean and dry the tiles before applying a second coat of 511 Porous Plus sealer over the tiles and grout. ALWAYS cover the tiles during and after installation to prevent damage and/or staining of the tiles until construction is complete. The guidelines above are for directional use only. Each customer is responsible for hiring a skilled installer that has both experience and expertise in installing cement tiles. Zia Tile is not responsible for installing, ongoing care, or problems arising from any orders after receipt of product. Regularly clean the tiles with acid-free, pH neutral detergent. A natural patina can be expected to develop over time, as the floor begins to wear, and is to be expected. Water spotting can be avoided with a regular cleaning routine, which includes resealing the floor every two to three years, depending on the conditions of wear. We’ll ship tile anywhere that FedEx, UPS, DHL, and any LTL carrier can reach! If you live in Alaska, Hawaii, Canada, or a country outside of the United States, please email or call us for a custom freight quote. All normal tile orders will deliver using LTL carrier service. The LTL trucking company that is contracted to deliver your order will contact you to arrange a specific date and time for curbside delivery. The freight company is your resource if you have special requests such as inside delivery, lift gate, pallet jack, or if you need to change the date and/or time of your delivery. During delivery, all customers are responsible for inspecting the shipment for shortages or damages against the packing slip and noting those damages with the driver on the Bill of Lading. Any issues with the delivery must be photographed and noted with the delivery driver on the shipping documentation in order to initiate a claim. The claims agents for the shipping company will request photos and written documentation to process the claim. Please take the time to ensure that this is done effectively during delivery in order to avoid any costs associated with replacement material for your order. Ensure that you have someone on-site to accept your delivery as any missed deliveries or delivery refusals will result in storage and redelivery fees to the trucking company. Contact us within 48 hours after your delivery and we will work to replace any items damaged in transit as quickly as possible! We offer all customers the option to order any of the tile patterns through our website. All sample orders are limited to up to 4 per tile design, and customers may order a sample of as many different tile designs as desired. We make every effort to ship all samples within the same shipment, but some samples may ship separately if specific samples are out of stock at the time the order is placed. Samples are $3 each and shipping is $10 for every 3 tiles shipped. For questions regarding samples, please email info@ziatile.com. variation from tile to tile. These standard characteristics enhance the beauty and wear-ability of the product. Understanding how cement tile colors are achieved and wear over time is critical to appreciating the beauty and performance of the tile. All customers are responsible for sealing and protecting cement tile ordered from Zia Tile to ensure that these tiles are maintained correctly. While cement tiles are commonly installed on floors, showers, backsplashes, patios, and many other home, retail, and restaurant environments, it is important the client properly research the performance of cement tile for their application. Zia Tile is always here to advise on how and where to successfully install cement tiles but makes no guarantees on performance or maintenance after installation. Zellige – Moroccan zellige is handcrafted and handcut, with inherit variation from tile to tile in color, texture, and shape. All customers are responsible for the correct installation and maintenance of zellige ordered from Zia Tile to ensure that these tiles are maintained correctly. While zellige tiles are commonly installed on floors, showers, backsplashes, patios, and many other home, retail, and restaurant environments, it is important the client properly research the performance of zellige tile for their application. Zia Tile is always here to advise on how and where to successfully install zellige tiles but makes no guarantees on performance or maintenance after installation. In stock tile orders ship within 2 business days of order receipt. Custom design order lead times vary depending on the design and schedule needs of clients. Rush orders are possible and Zia Tile will advise of shipment dates as they are available. We will make every effort to meet or reduce lead times where possible but there are no guarantees due to the custom nature of the manufacturing process. All customers are solely responsible for providing measurements and quantities needed for each order. In addition, all customers are strongly advised to order 15% more tile than necessary to ensure that enough product is on-hand to successfully complete installation. Please consult your tile installer to ensure that your take-off quantity and overage calculations are correct. Keep in mind that the price of the overage quantity is minimal in comparison to the cost of rush product and one-off shipping in the event that more product is needed after the original order due to site conditions, mistakes in order quantities, or installation errors. Trying to save a few hundred dollars by decreasing or eliminating the standard 15% overage is the most common mistake customers make when placing orders. This mistake can end up costing 5-10 times more to place small incremental orders AND significantly delay projects by weeks or months! Our website automatically generates a 15% overage calculation by separate line item in the ordering cart. We cannot advise strongly enough to ensure that you have 15% overage on all of your orders to ensure your project is successful! All completed orders require 100% payment at time of order. Payments are processed online or via phone. Invoices are provided and copies are sent via email as well as available by accessing the Sign In function on our website. Sales tax is applied at the time of payment and paid as part of the original order. Shipping costs are charged with each order. Any changes to orders, shipping dates, and/or shipping methods will result in change order costs that will be determined at the time of the change request. Zia Tile does not accept returns for unopened boxes of tile. All of our orders ship throughout the US and Canada using LTL trucking providers. The LTL trucking company that is contracted to deliver your order will contact you to arrange a specific date and time for curbside delivery. Customers should contact the freight company or Zia Tile for special requests such as inside delivery, lift gate, pallet jack, or if it is necessary to change the date and/or time of your delivery. During delivery, all customers are responsible for inspecting the shipment for shortages or damages against the packing slip and noting those damages with the driver on the Bill of Lading. Any issues with the delivery must be photographed and noted with the delivery driver on the shipping documentation in order to initiate a claim. The claims agents for the shipping company will request photos and written documentation to process the claim. Please take extra time to ensure that this is done effectively during delivery in order to avoid any costs associated with replacement material for your order. Any missed deliveries or delivery refusals will result in storage and redelivery fees paid to the trucking company. If there are any issues, please contact Zia Tile as soon as possible but no more than 48 hours after delivery and we will work to replace any items damaged in transit as quickly as possible! Contact us immediately if needed! Zia Tile strongly recommends that all customers heavily leverage a tile installer in the up front planning, measuring, ordering, sealing, and maintenance of cement tile, zellige, or ceramic products. Leveraging an installer with specific experience and expertise will ensure that projects are completed successfully. Zia Tile is not responsible for installation, on-going care, or problems arising from any orders after receipt of the product. Our supply chain is lean, which is why we are able to price our tiles approximately 30% cheaper than other suppliers. We will warehouse your product free of charge for 4 weeks. After that time has expired, each order that is held due to customer receiving delays will incur a $300 charge per week. All customers acknowledge and accept the terms and conditions of sale outlined above by placing orders.